Wearing a suit built for him by Tony Stark, Kevin O'Brien became Guardsman, an armored powerhouse nearly as strong as Iron Man himself. Unfortunately, an overlooked bug in the cybernetic interface software drove O'Brien insane with jealousy. His out-of-control emotions made him a dangerous new enemy for Iron Man. Last updated by DAMartin on August 25, 2018. Did Spider-Man own a dog? Has the Witchblade ever possessed a man? Is Iron Man naked under his armor? You get to share your knowledge with everyone by contributing what you know. We try to fill-in as much info as we can, but it's up to you to fine-tune the Character Profiles, so please, help us out! Contribute Profile Information for Guardsman. 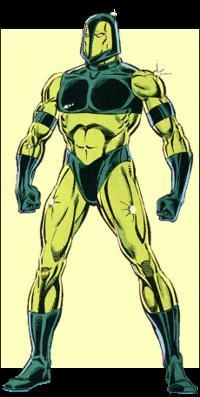 I believe there was a Spider-Man Animated series figure called "Vault Guardsman" who is one and the same. While they are aesthetically the same, the Iron Man figure represents the original Guardsman, Kevin O'Brien, while the Spider-Man one representshis army-builder successors who guard the superhuman prison Vault wearing mass-produced versions of the deceased O'Brien's armor.